Julesburg Colorado has influenced transportation and communication throughout history. Historically, over 350,000 emigrants traveled routes parallel to the Platte River on their way to the mineral wealth of the American West. It was the interstate highway of the 1800's. 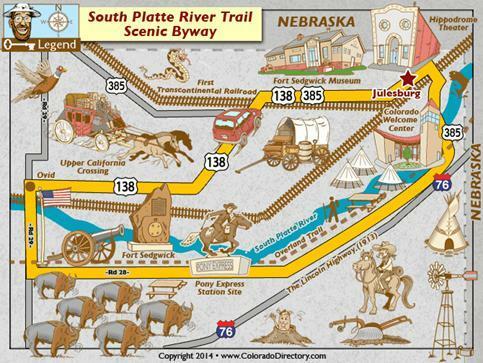 Today, Interstate-76 and The South Platte River Trail are a half-mile and one hundred & fifty years apart! This area was claimed in turn by Spain and France. United States buys Louisiana from France, northeast Colorado is included. Stephen B. Long explores the area calling it the “Great American Desert”. Beaver pelts are found to be useful for manufacturing men’s hats. Fur trappers come into this area armed with rifles and traps in pursuit of beaver. A market for beaver pelts was readily available at the fur-trade posts along the South Platte River. Fur trappers and traders also sought trade with the Indians, often trading for bison hides. The Oregon Trail becomes the main route westward. The first Telegraph line is established and Morse Code is sent by Samuel Morse from Washington to Baltimore. Gold is discovered in California bringing tens of thousands of new settlers westward. Jules Beni establishes a trading post (Julesburg - the first of four towns with the same name) along the South Platte River. Central Overland California & Pikes Peak Express Company (C.O.C.& P.P, sometimes called “Clean Out of Cash and Poor Pay” by disgruntled employees) was formed by Russell, Majors & Waddell with Julesburg designated as a "home station." The C.O.C. & P.P. ran tri-weekly coaches to and from Denver carrying passengers, gold and other express. The Colorado Territory is created. The Overland Telegraph line reaches Julesburg. Weld County is created which includes the entire northeast portion of the Colorado Territory. Homestead Act encouraged 600,000 families to travel westward by giving them land (usually 160 acres) almost free. Warfare with hostile Indians escalates in eastern Colorado. Indian raids close the Overland Trail to travel. Troops arrive at the Julesburg stage station and pitch tents. Building begins immediately and troop strength soon reaches 1,000 men. Camp Rankin (later renamed Fort Sedgwick) is established about one mile west of the Julesburg stage station. Troops are ordered to protect the Transcontinental Telegraph line, as well as travelers along the overland trail routes. The Sand Creek Massacre. A 675-man force of Colorado U.S. Volunteer Cavalry lead by John Chivington attacked and destroyed a peaceful village of Cheyenne and Arapaho and in southeastern Colorado Territory, killing and mutilating an estimated 70–163 Native Americans, about two-thirds of whom were women and children. In retaliation for the Sand Creek Massacre, Indians raid Julesburg and kill 15 troops and a number of civilians. The warriors return and burn Julesburg. Jules Beni's first Julesburg comes to a fiery end! Camp Rankin, now greatly expanded is renamed “Fort Sedgwick”. William H. Jackson, early western photographer & artist, visits Julesburg #2 and makes notes for his later paintings of the Upper California Crossing at Fort Sedgwick. Lt. General William T. Sherman visits the post. With the arrival of the Union Pacific Railroad, north of the river, Julesburg #3 springs up as an "end-of-track" town. The town's population grows, by some estimates, to 8,000, earning the dubious title of “Wickedest City in the West”. The first transcontinental railroad is completed when the Union Pacific and Central Pacific railroads join their tracks at Promontory Point, Utah. Pleasure hunters rode the rails and began the slaughter of the American bison. Millions were killed and the species was nearly exterminated. “Buffalo” robes were so abundant that they could be purchased for $3.00 along the Overland Trail. Fort Sedgwick is officially abandoned by US Army. While attempting to control the Great Plains and confine all Indians to reservations, Colonel George Armstrong Custer and his men are wiped out at the Battle of Little Bighorn by Sioux forces. Colorado is admitted to the Union as the 38th state. Julesburg makes its final move (hopefully). At the Junction of the Transcontinental Railroad heading to Cheyenne and the newly laid track heading west into Denver there was a town named, "Denver Junction." Again, to meet the railroad, the citizens of Julesburg #3 packed up and moved to this new town. There were more "Julesburg-its" than "Denver Junction-ers" so the name Julesburg stuck for the fourth time. Fort Sedgwick Military Reservation is opened for settlement. Logan County created out of Weld County. The Town of Denver Junction is officially renamed and incorporated as the 4th (and hopefully the last) Julesburg town site. Site for the Town of Sedgwick is surveyed. The "Italian Caves" are dug south of Julesburg by Uberto Gibello, partly for recreation and partly as a tourist attraction. Sedgwick County is carved out of Logan County. Work begins on Jumbo Reservoir (sometimes called Julesburg Reservoir) west of Sedgwick. Ovid town site is surveyed. The Great Western Sugar Beet Refinery construction begins in Ovid. The Town of Ovid is incorporated. Construction of I-80 S near the Town of Sedgwick revealed fossils that were recovered by archeologists. Hunt Brothers lose control of the Great Western Sugar Company. Interstate-80-S is officially renamed I-76 honoring Colorado’s statehood centennial. The Colorado Welcome Center at Julesburg opens at US Hwy 385 and I-76. Sugar Beet Refinery at Ovid is demolished.